During the 1990s, Guatemala and El Salvador signed comprehensive peace accords that ended decades of bloody internal conflict. The two agreements—as well as the subsequent peace-building process—have had an impact on the traditional concept of peace, since these accords are pioneering efforts in what is considered to be the second generation of multidisciplinary peace operations (their scope goes beyond the cease-fire). One of the main objectives of the peace accords and the peace-building process was the strengthening of the emerging democratic processes in the post-conflict period. It has been over a decade now since the signing of the peace accords in Guatemala El Salvador. In both cases, electoral or political democracy is still in place and the political system has been given a chance. The armed militants in both countries have now formed their own political parties; they have taken part in elections and have gained access to positions in the Congress. Many problems still remain, however, and democracy is far from being firmly established. Many old problems and new threats are challenging the process of democratization. There is no doubt that peace has had an impact on the process, but some areas have made more progress than others, and in some the advances may even have stalled. While several specific studies on the negotiation processes and peace-building in Guatemala and El Salvador have been published, few of these studies have approached the issue from a comparative standpoint. Also, hardly any comprehensive studies concerning recent democratic development in these countries have been made. In this book, two research teams present an up-to-date profile of the democratic process in the two countries, based on new information and using several techniques for comparative analysis. 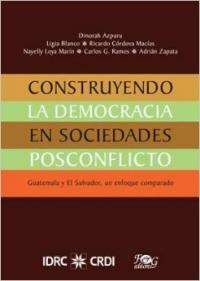 The authors also provide an assessment of the existing interaction between peace and democratization. Dinorah Azpuru is a Professor in the Department of Political Science, Wichita State University, United States, and an Associate Member of the Asociación de Investigación y Estudios Sociales (ASIES), Guatemala. Ligia Blanco is a researcher with ASIES and a Professor of Political Science in Rafael Landívar University (Guatemala). Ricardo Córdova Macías is the Executive Director of the Fundación Dr. Guillermo Manuel Ungo (FUNDAUNGO) in El Salvador. Nayelly Loya Marín is a researcher with the FLACSO Program (Facultad Latinoamericana de Ciencias Sociales), El Salvador. Carlos G. Ramos is the Academic Coordinator of the FLACSO Program (Facultad Latinoamericana de Ciencias Sociales), El Salvador. Adrian Zapata was a Professor at the University of San Carlos (USAC), Guatemala. Teacher professional development is front and centre at the Annual mEducation Alliance Symposium.